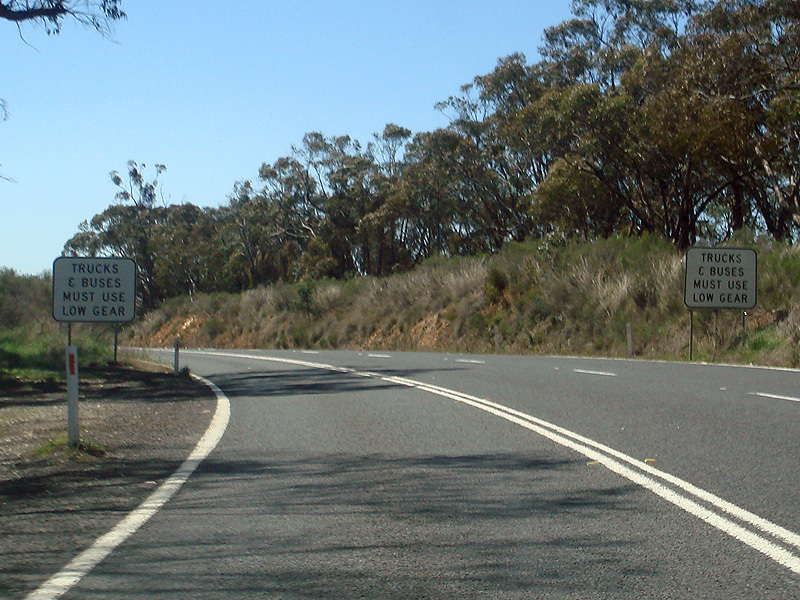 A41 is a rural highway in western and southern New South Wales. 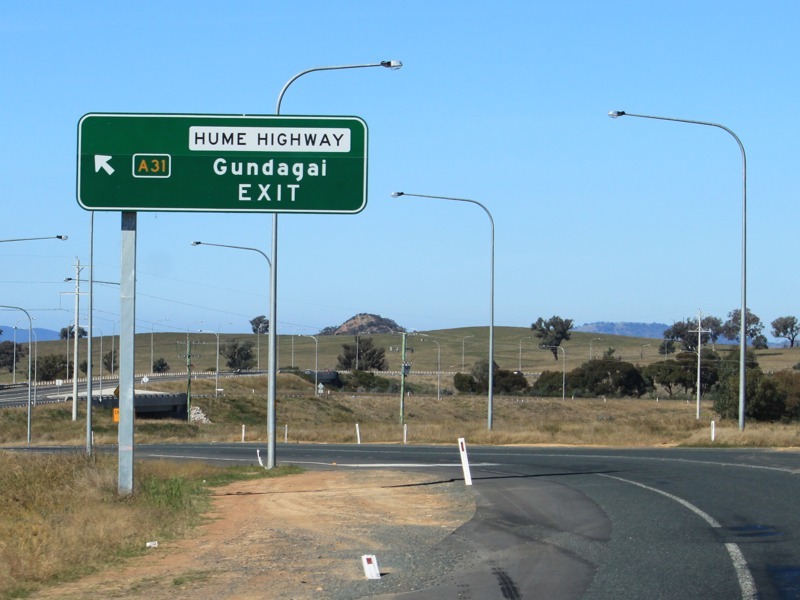 It services rural communities and links the Hume Highway with the Mitchell & Great Western Highways (A32) and Sturt Highway (A20). 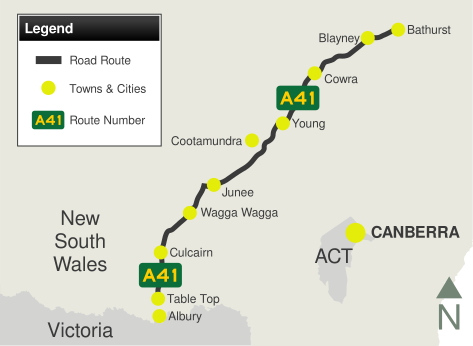 The Bathurst to Cowra section of the route, the Mid Western Highway, forms part of the most direct route between Sydney or Brisbane and Adelaide (via Hay), and consists of mainly two-lane rural highway standard. 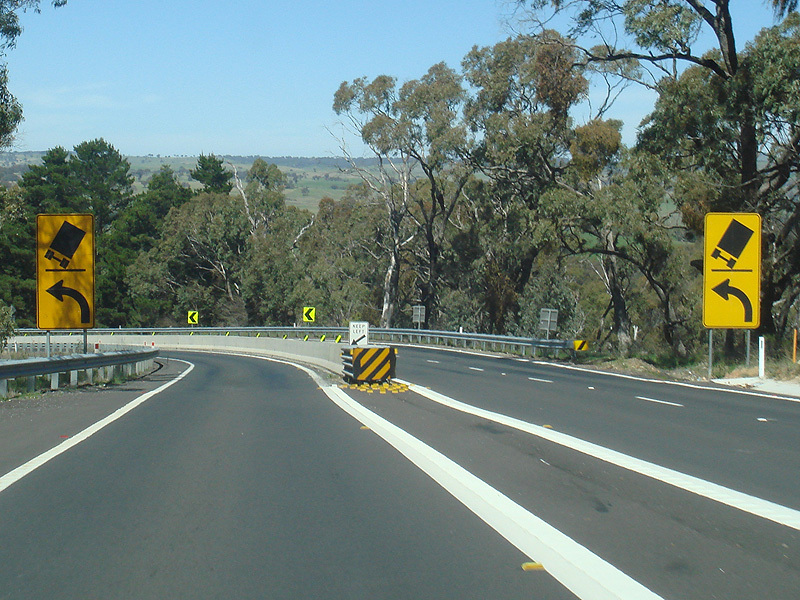 Feb 2006: Construction of a new bridge over Coombing Creek, Carcoar. 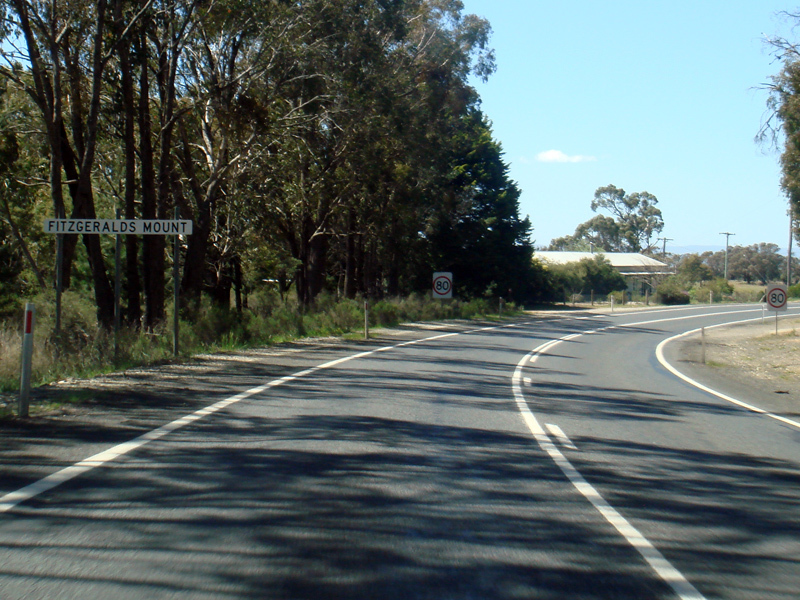 RD sign on Olympic Hwy (A41) at Table Top, May 2011. 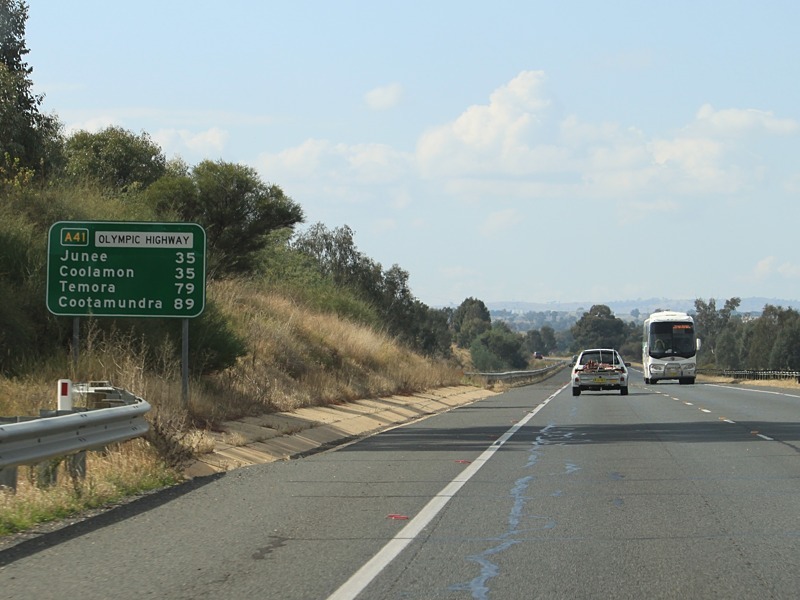 AD sign on Mitchell Hwy (A32) approaching Great Western Hwy (A32), Mid Western Hwy (A41) and Brilliant St in Bathurst, August 2013. 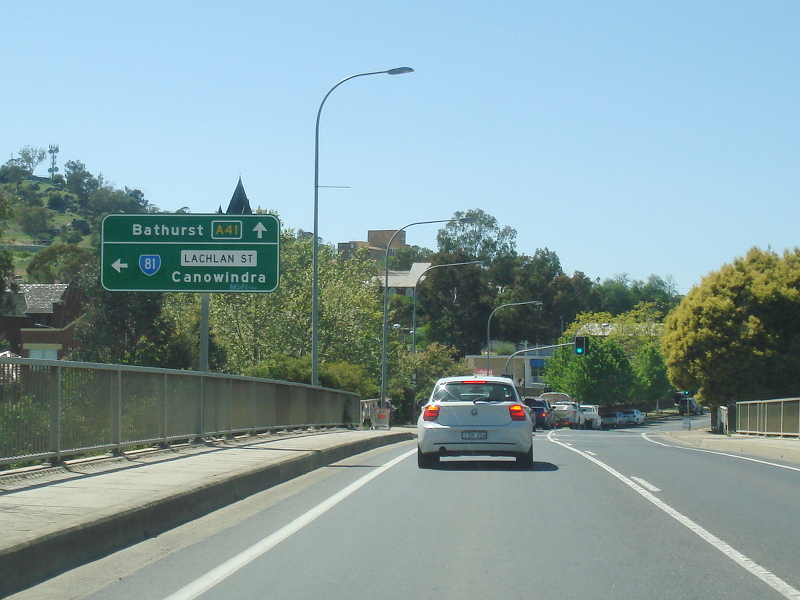 RD sign in Wagga Wagga, May 2011. 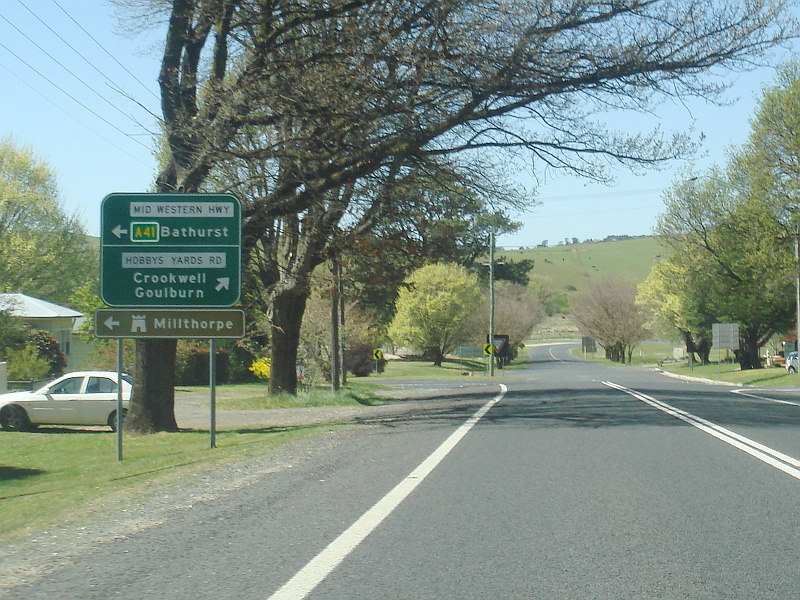 ID sign at the roundabout with Mitchell Hwy (A32), Great Western Hwy (A32) and Brilliant St in Bathurst, August 2013. 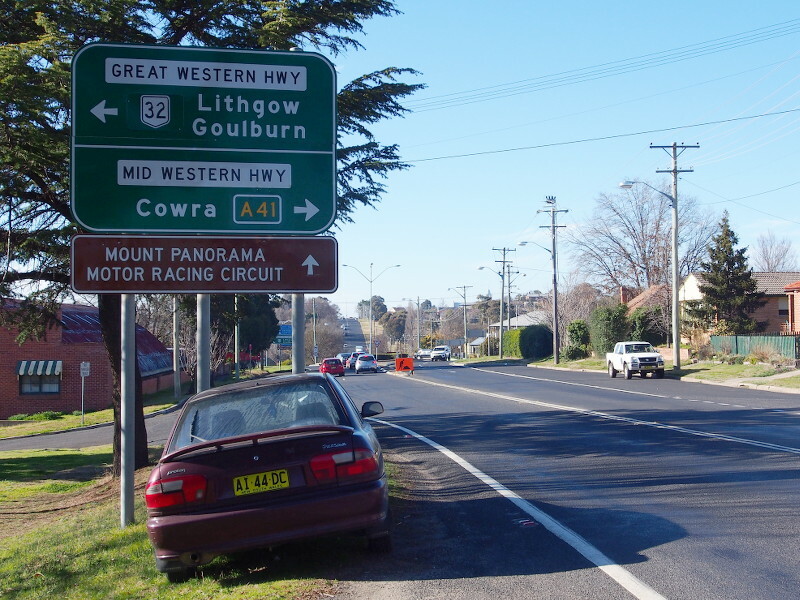 Distance sign at Boorooma, May 2011. 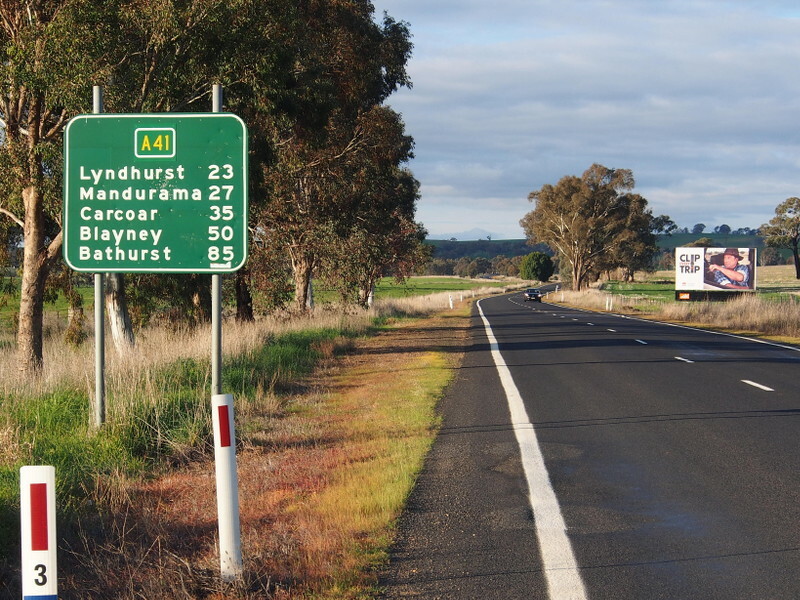 Distance sign on Mid Western Hwy (A41) at Bathurst, August 2013. 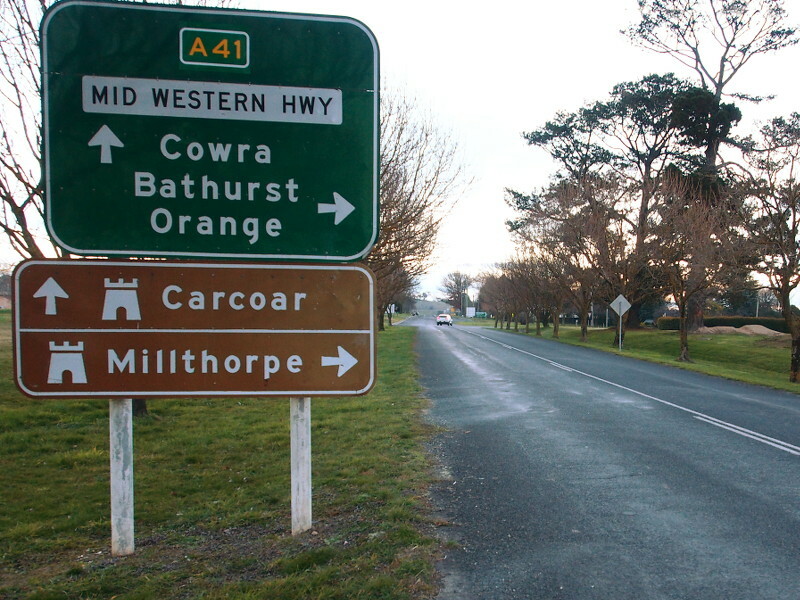 AD sign approaching Mid Western Hwy (B64) and Mid Western Hwy (A41) at Cowra, September 2013. 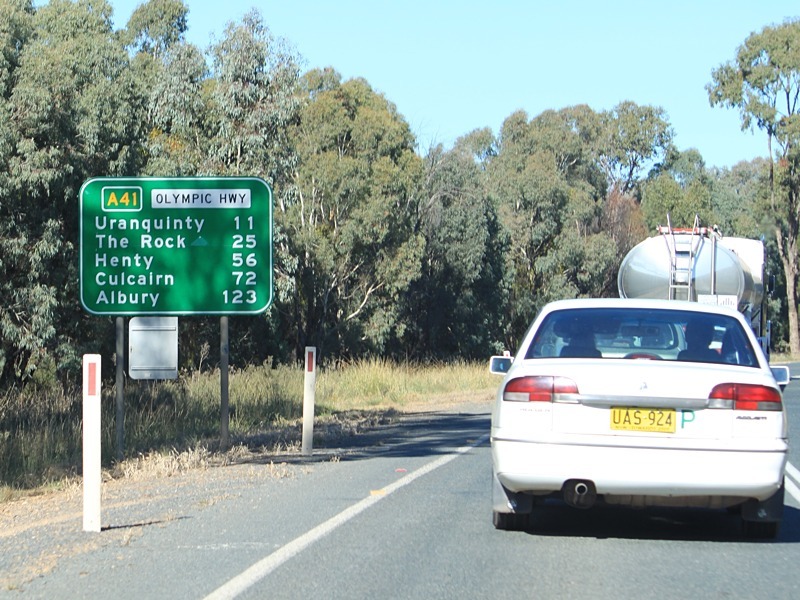 AD sign on Hobby's Yards Road approaching Mid Western Highway (A41) at Blayney, August 2013. 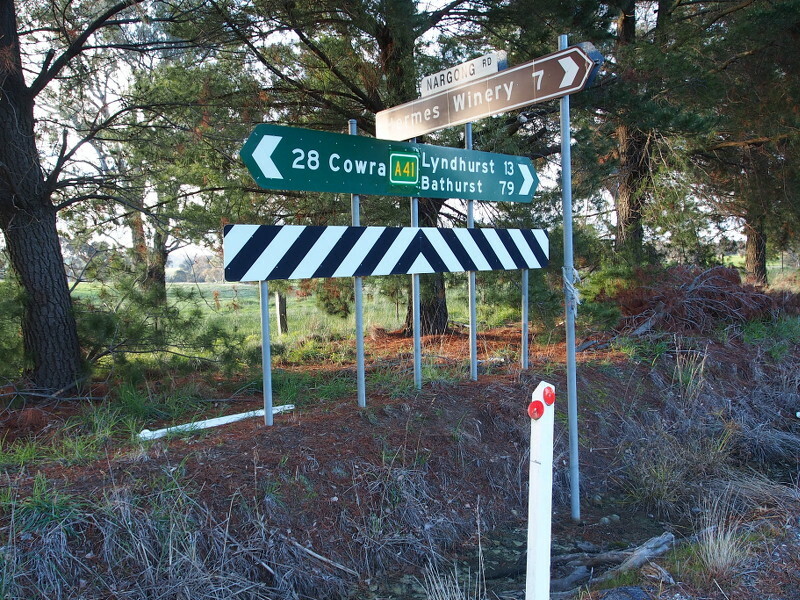 AD sign in Cowra approaching Lachlan St (B81 and unnumbered), September 2013. 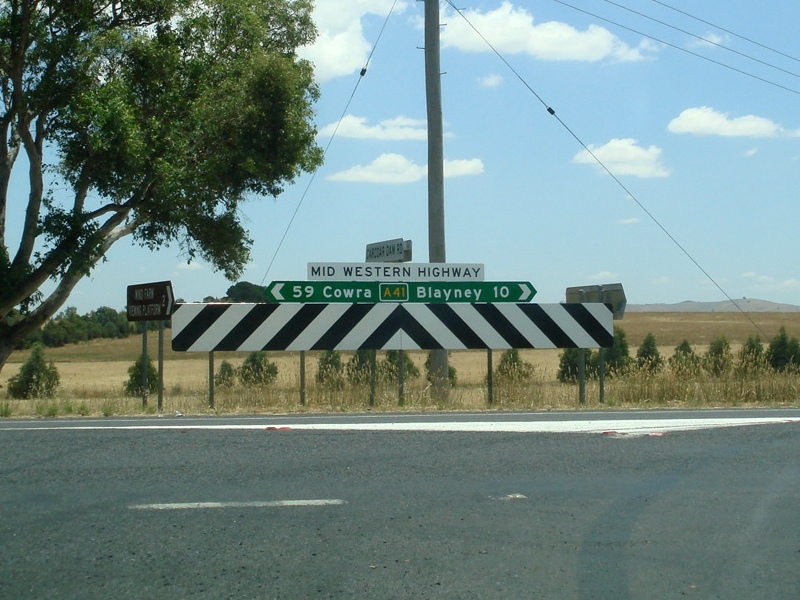 Intersection directional sign facing Carcoar Dam Rd at Blayney, December 2012. 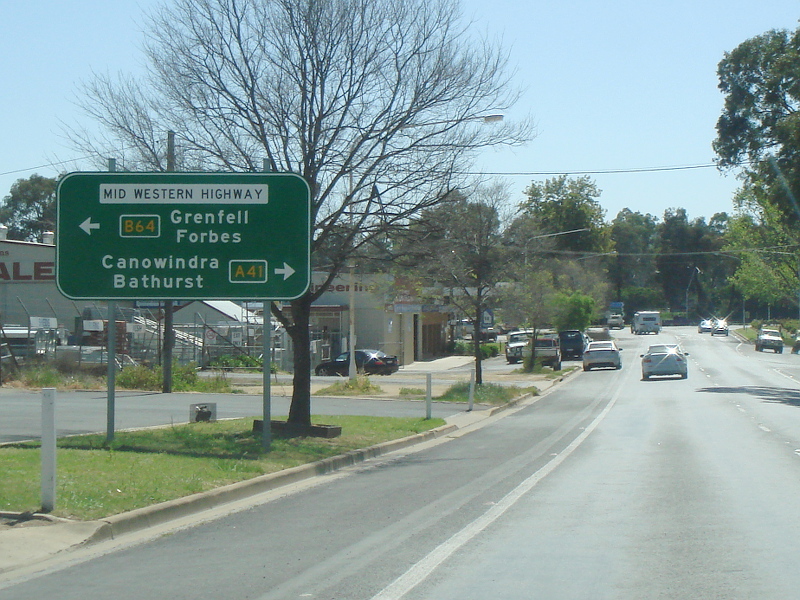 AD sign approaching Fitzroy St, Cowra, September 2013. 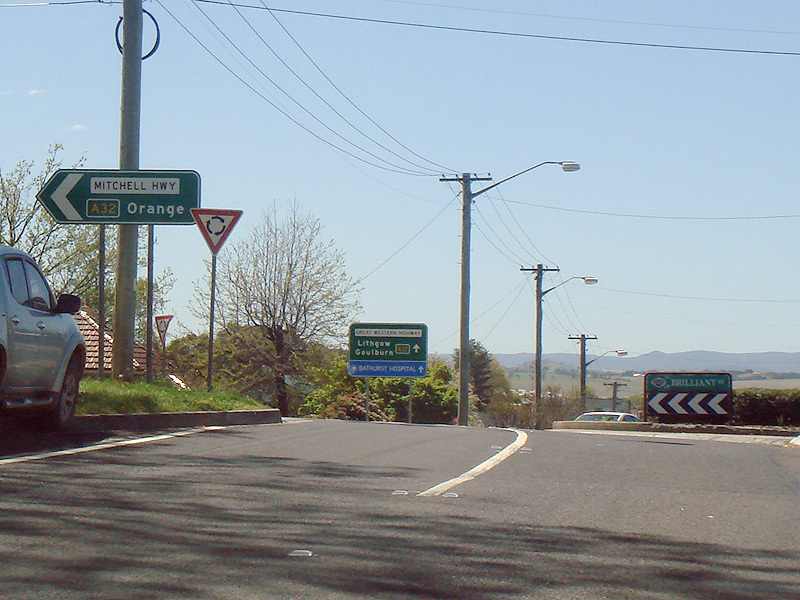 ID sign assembly facing Nargong Rd at Woodstock, August 2013. 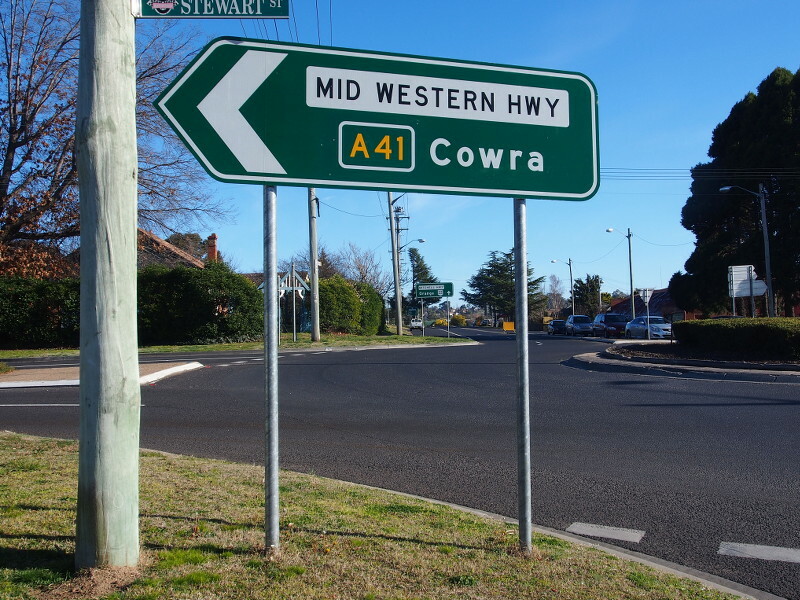 Distance sign at Mid Western Hwy (A41) leaves Cowra, September 2013. Intersection directional sign facing Walli Rd, Woodstock, December 2012. 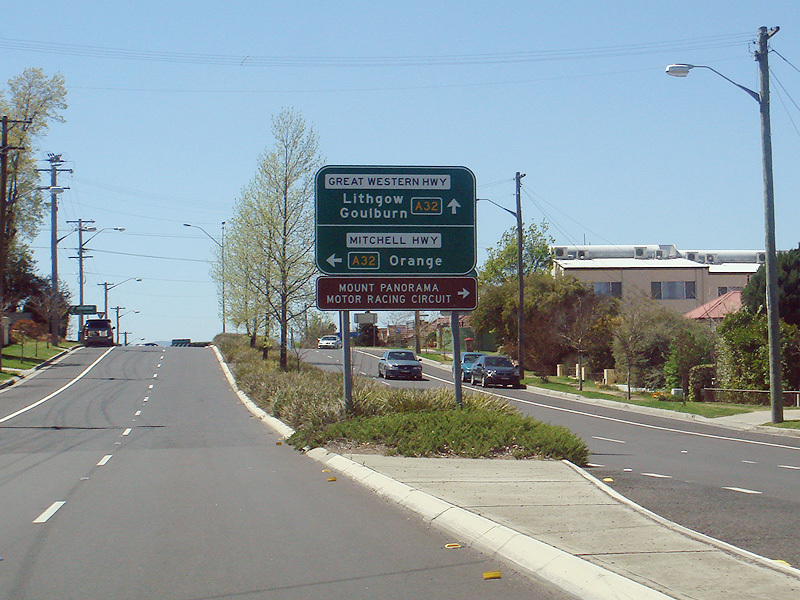 AD sign at Woodstock approaching George Russell Dr and Reg Hailstone Way, September 2013. 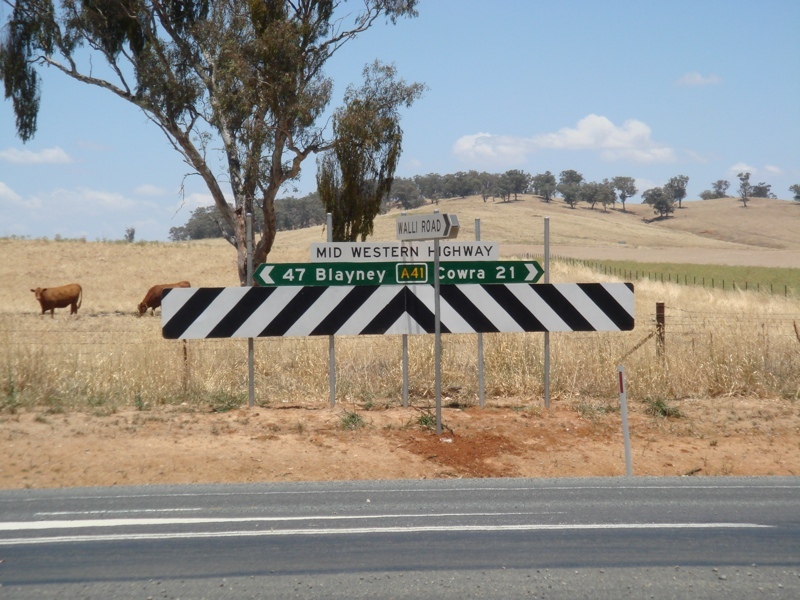 ID signs facing Lachlan Valley Way (B81) at Cowra, December 2012. 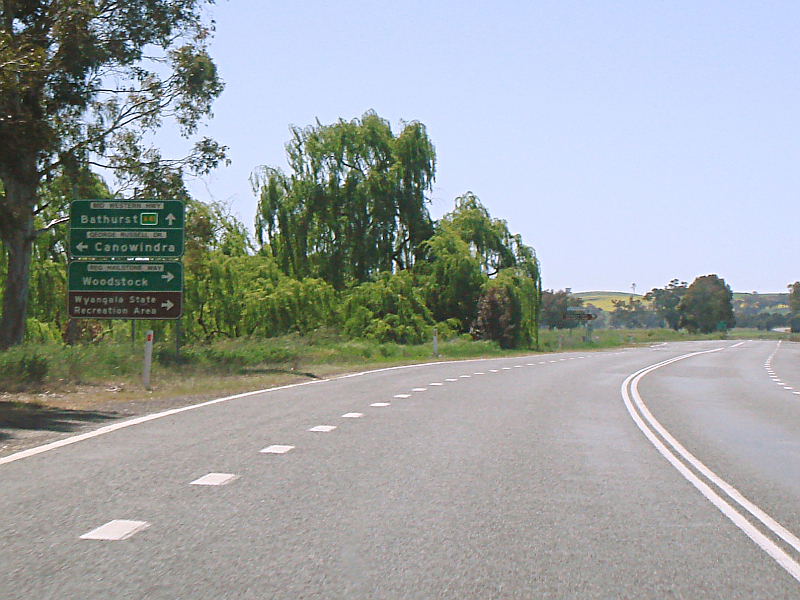 RD sign as Mid Western Hwy (A41) leaves Woodstock, August 2013. 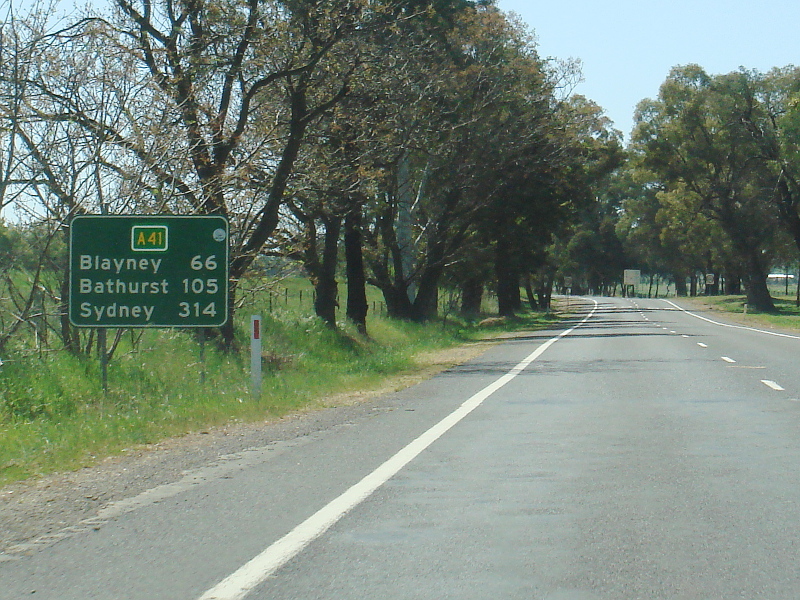 AD sign approaching Ashmont St and the Olympic Hwy (A41) and Sturt Hwy (A20) split at Moorong, May 2011. 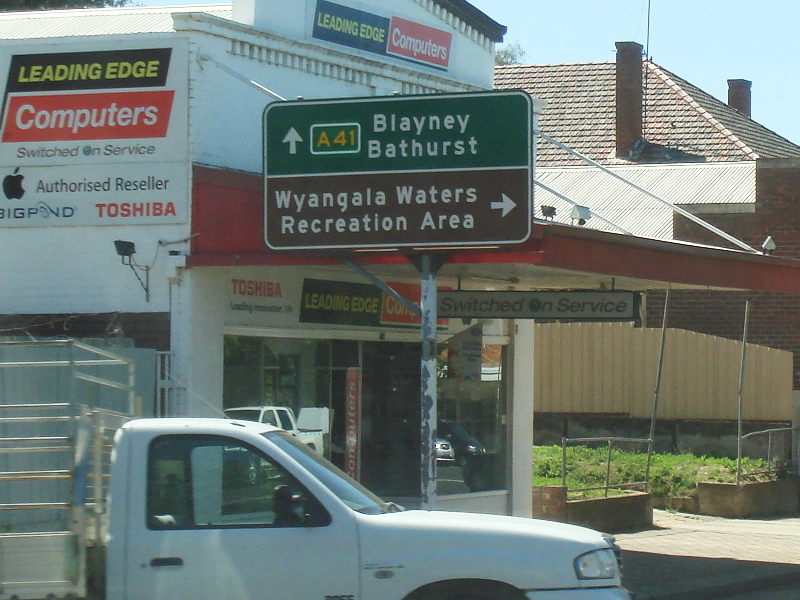 AD sign approaching Belubula Way, Mandurama, September 2013. 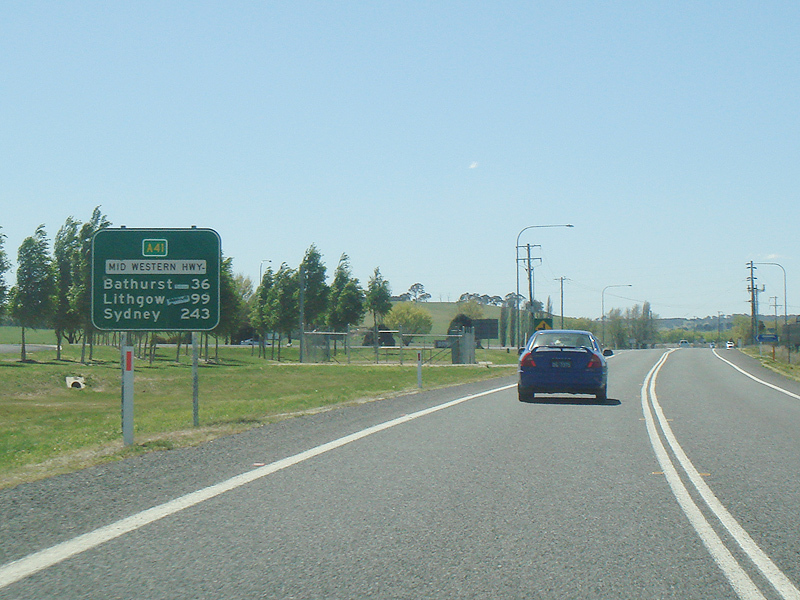 RD sign on Olympic Hwy (A41) at Moorong, May 2011. 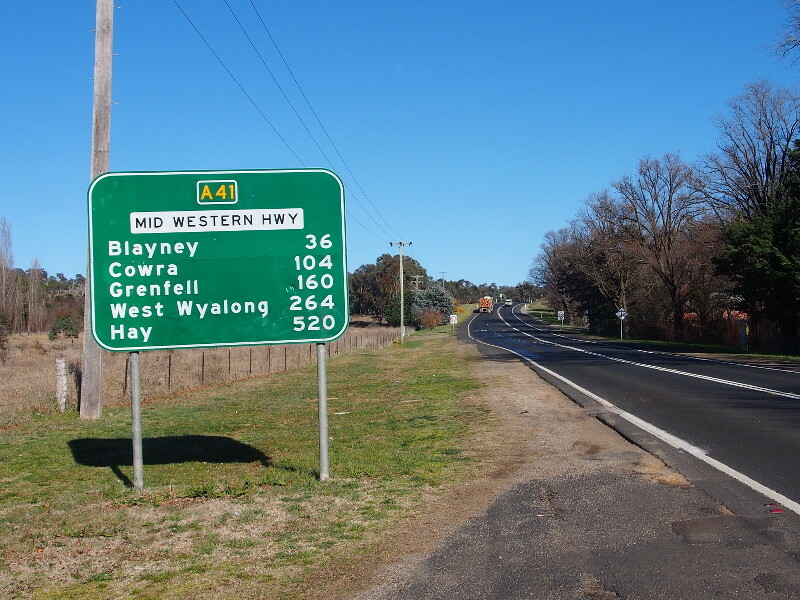 Mid Western Hwy (A41) entering the town of Blayney, September 2013. 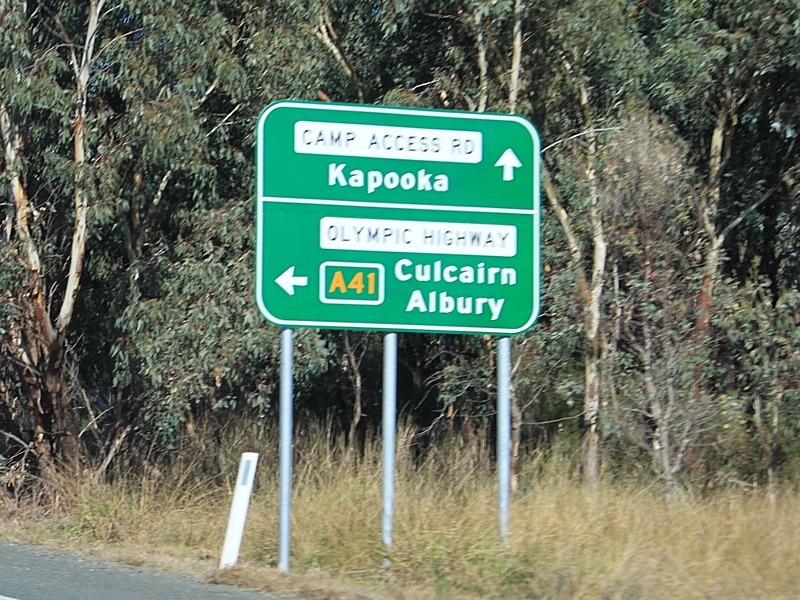 AD sign approaching Camp Access Rd at Kapooka, May 2011. 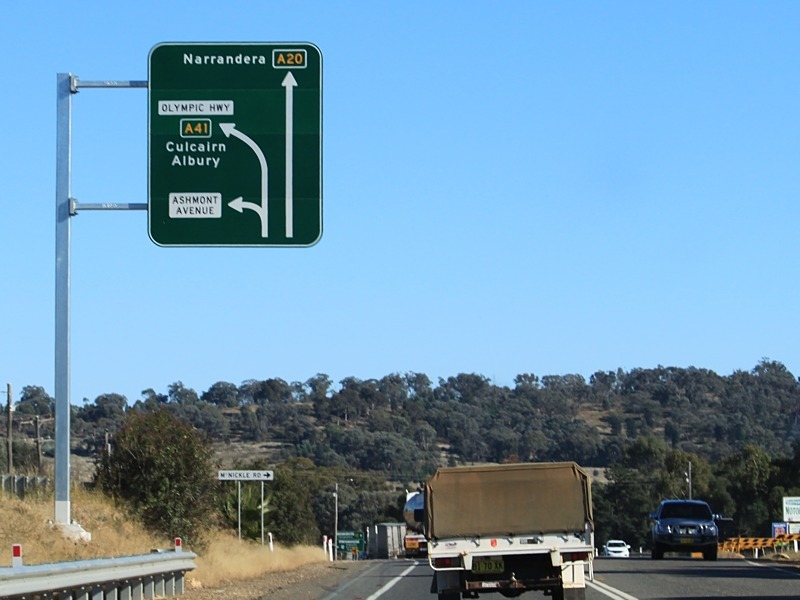 AD sign approaching Hobby's Yards Road in Blayney, September 2013. 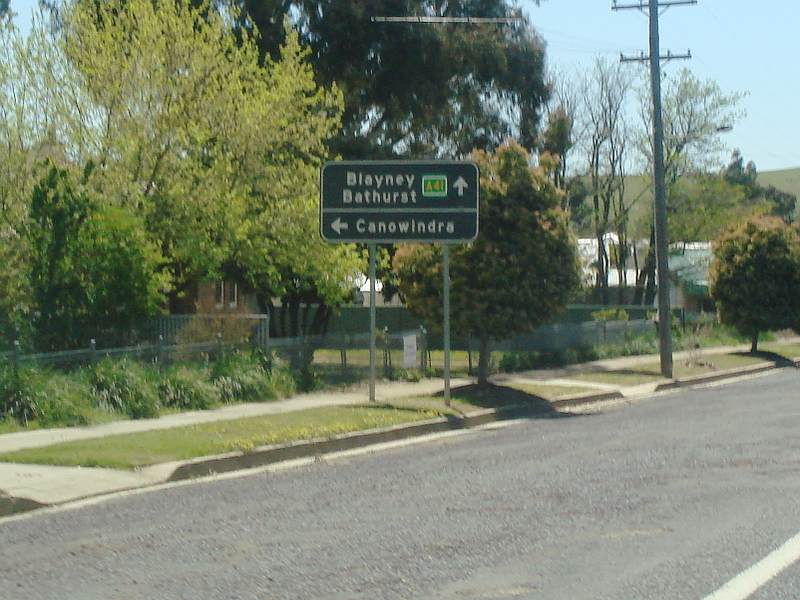 AD sign near Adelaide St North and Maria St in Blayney, September 2013. 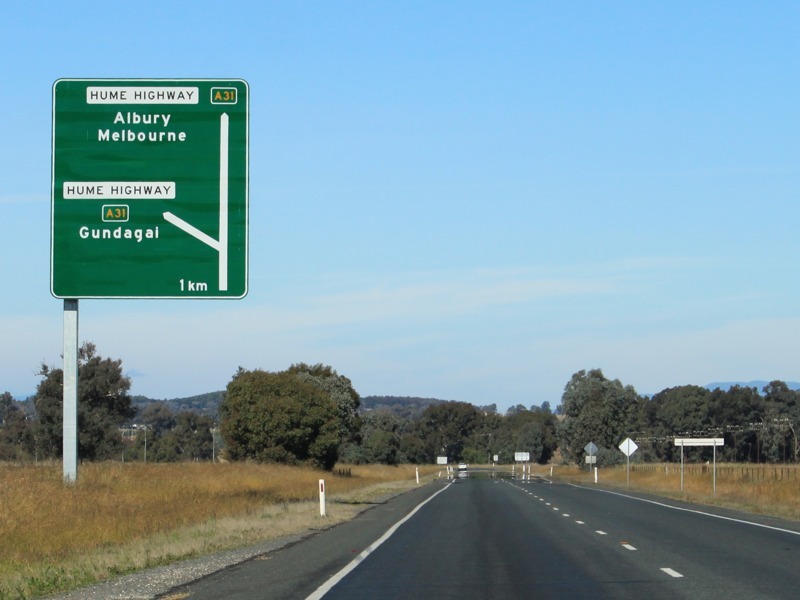 AD sign at Table Top approaching Hume Hwy (M31), May 2011. 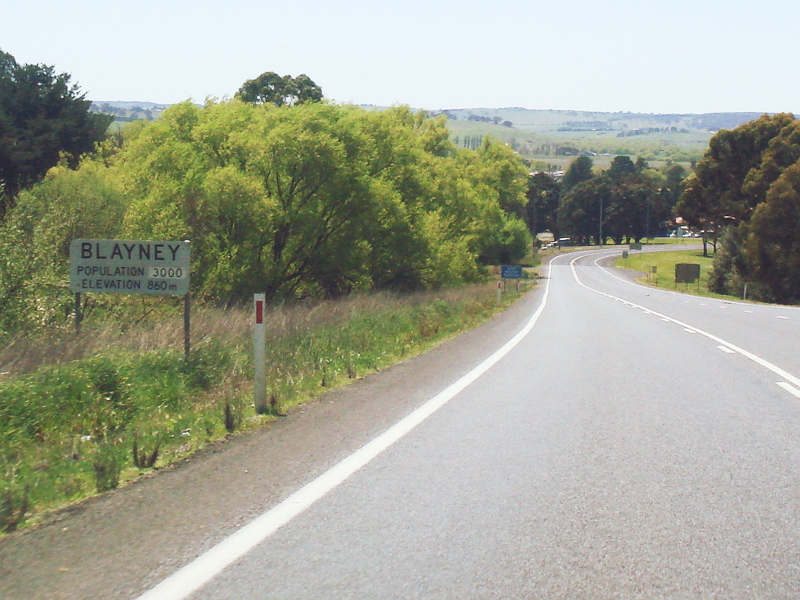 RD sign leaving Blayney, September 2013. 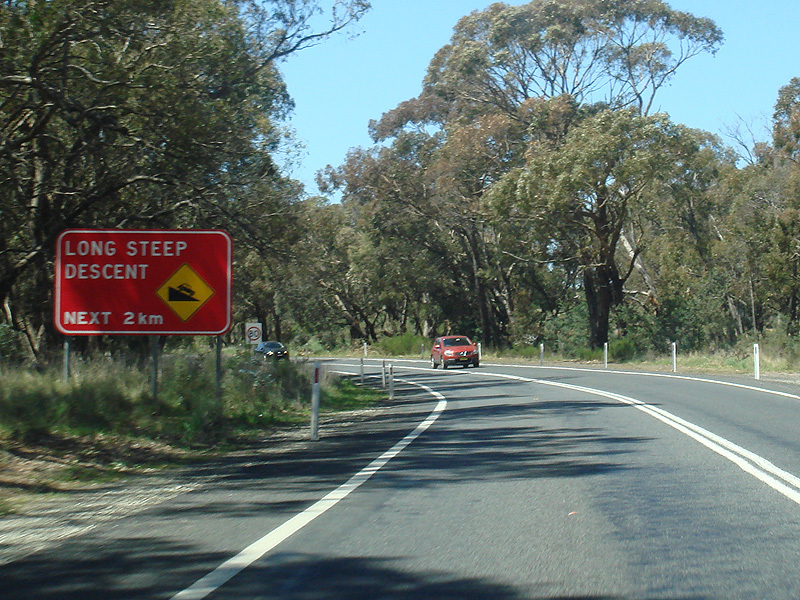 Mid Western Hwy (A41) as it makes its way down Fitzgeralds Mount, September 2013. 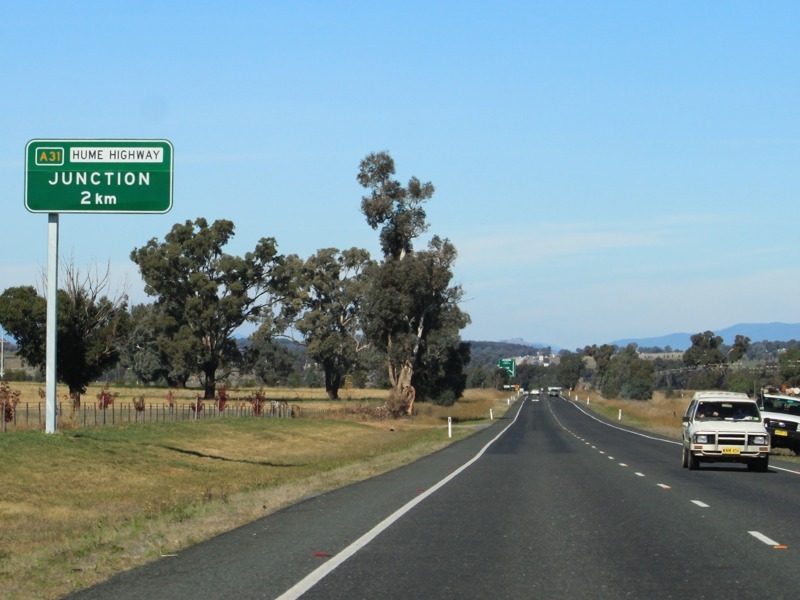 Intersection directional sign at the junction with Hume Hwy (M31) at Table Top, May 2011. 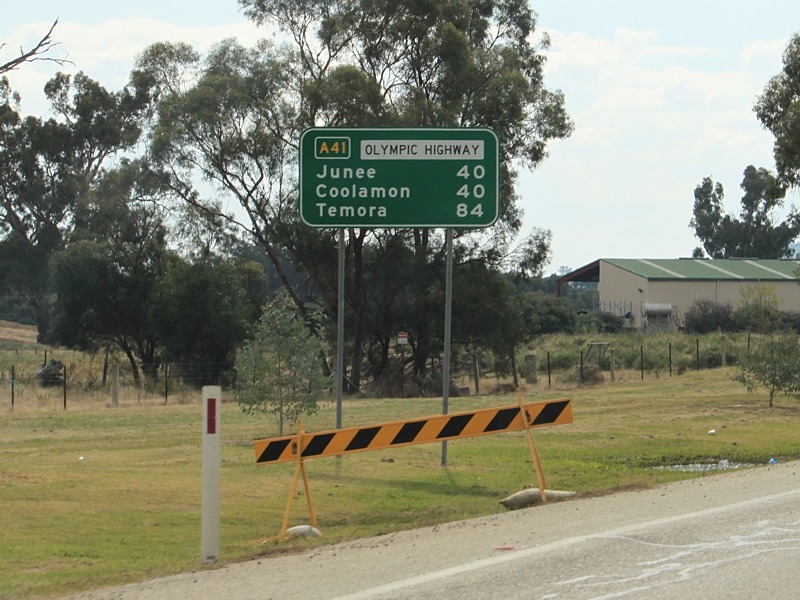 This is the southern terminus of A41. Warning sign for steep descent down Fitzgeralds Mount, September 2013. 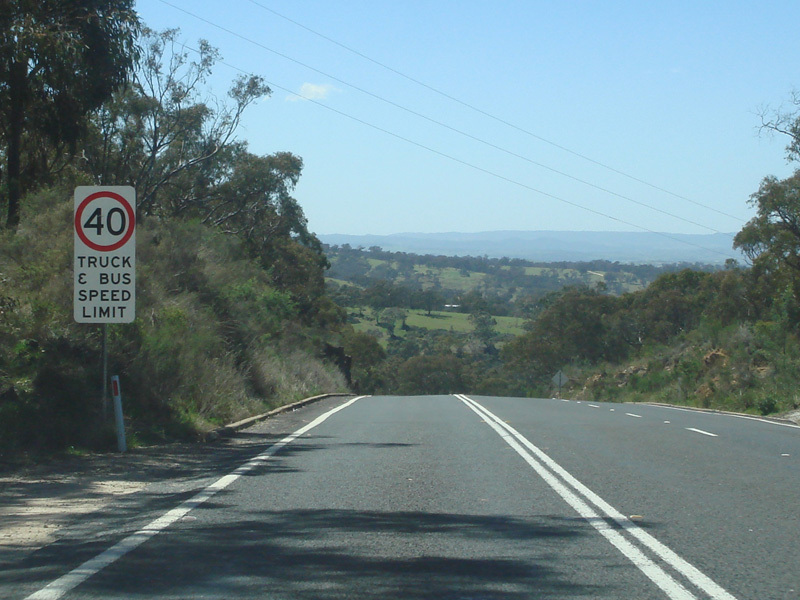 Special truck & bus speed limit as Mid Western Hwy (A41) as it makes its way down Fitzgeralds Mount, September 2013. 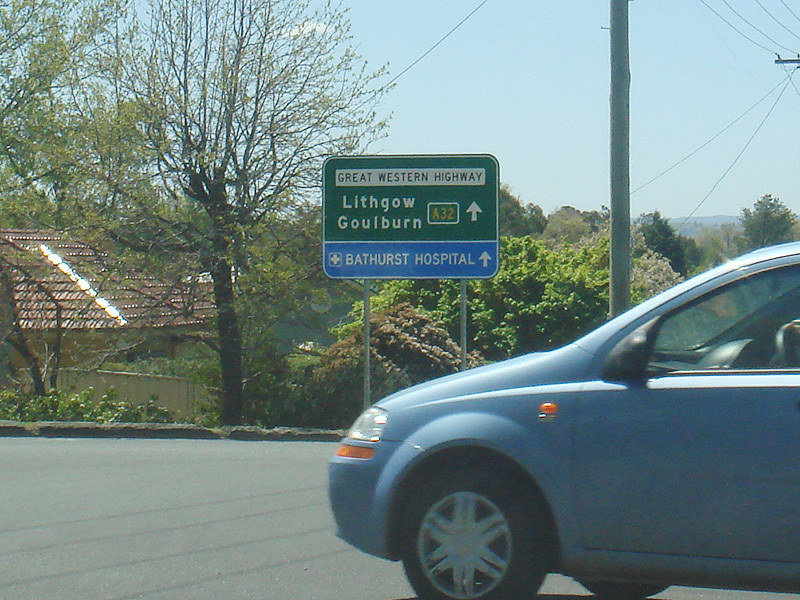 AD sign approaching the roundabout with Brilliant St, Mitchell Hwy (A32) and Great Western Hwy (A32) in Bathurst, September 2013. 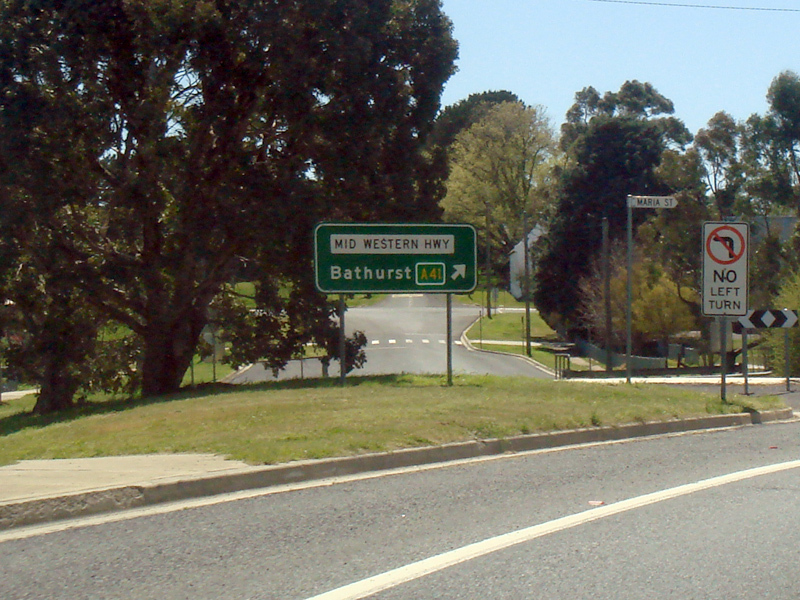 Northern terminus of A41: the roundabout with Brilliant St, Mitchell Hwy (A32) and Great Western Hwy (A32) in Bathurst, September 2013. 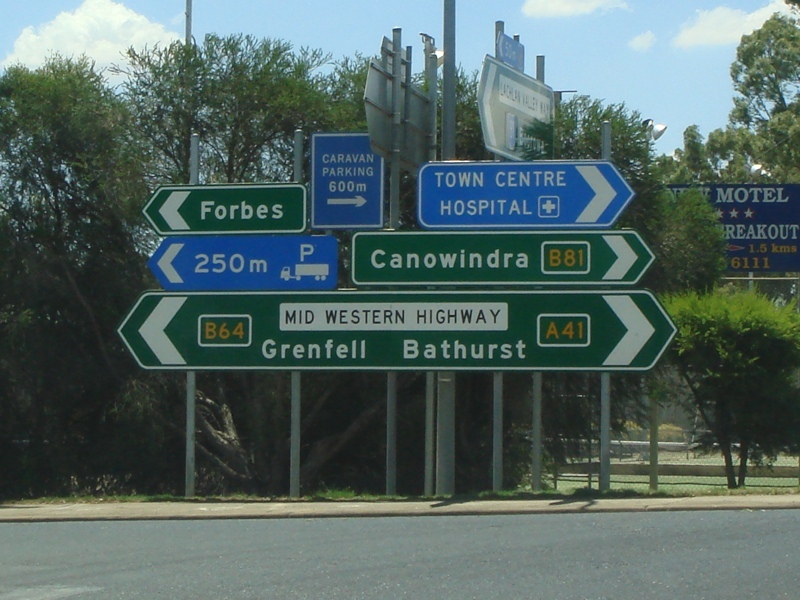 ID sign on the roundabout with Brilliant St, Mitchell Hwy (A32) and Great Western Hwy (A32) in Bathurst, September 2013. 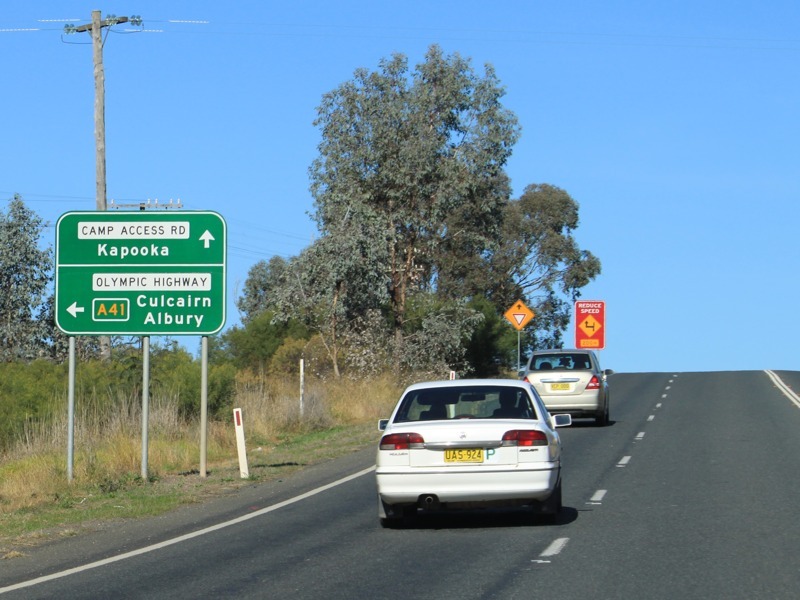 3 Roads & Traffic Authority, Community Update, Realignment of the Olympic Highway at Kapooka, December 2010. 4 Journal of Department of Main Roads New South Wales, Extract from September 1958 issue of "Main Roads"
This site © Paul Rands. All rights reserved. Some portions © (copyright) by their respective and credited owners. Permission must be obtained before using any images from this site. For details, please email by clicking here.